I remember getting pretty emotional at the end of FF7 Crisis Core. The last few minutes of the game and last CGI were really really good. Beauvoir's story. I remember just sitting there on the last line of text absolutely broken and crying. I dunno, for some reason this tugged at my heartstrings when I was a kiddo and despite the fact that KH1 hasn't really aged well in my opinion, it still manages to do it. I love the song here too. One and done. Man, what is this first post magic? Because of my age at the time, and having really seen nothing like it, FF7's famous scene got me... That FF7 OST is simply amazing too, but yeah that scene. That scene was really well set up and directed. That does wonders for dictating how you feel. First post does not disappoint, fully with you! OP says mark spoilers, and people here start using GIFs of their scenes and even requote them, what? I am kid of the late 80's and 90's. 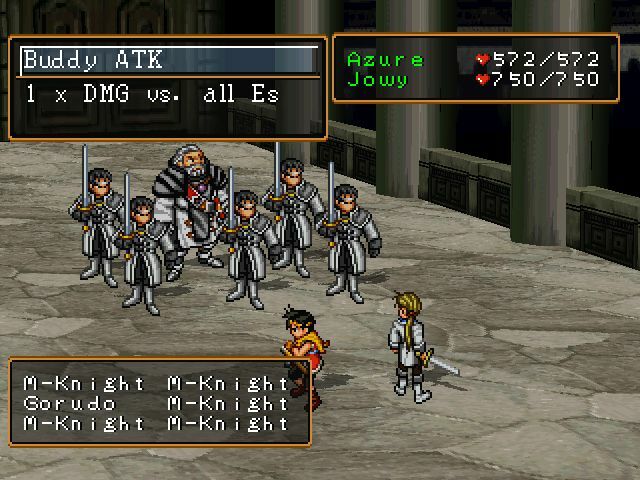 Suikoden 2 section was a great choice. For me it's the Opera House in Final Fantasy 6 . The amount of emotion they get from the music, the opera itself and Locke and Celes interactions move me every time. I absolutely love it . It's my favorite scene in gaming history since the moment I first saw it in Junior high. Undertale's pacifist ending, the fight with Undyne from Undertale's genocide run, and ending E from Nier Automata. Oh, and that one optional boss fight from Nier Automata as well. That one really got to me. 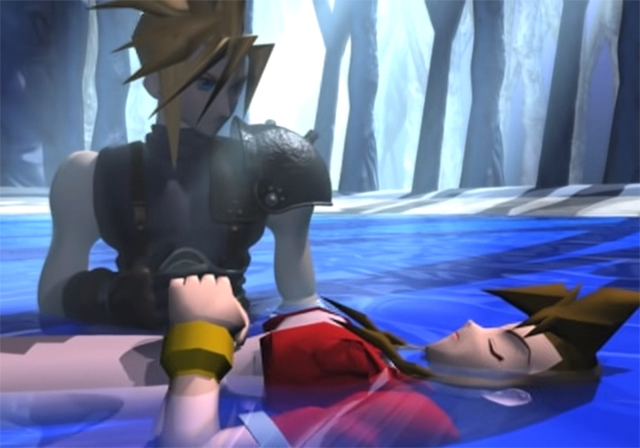 Probably the scene with Aeris/Aerith and the pearl falling in FF7 to keep it spoiler-free but I think those who have played it know the scene. The music and CG was just mind-blowing for the time and I had never experienced something like that in a video game before. I was sad and angry at the events of a video game. FF7. You know what I'm talking about. It mostly has to do with the fact that I was 12 years old when I saw it. I doubt I would've reacted much if I was older. I have a lot of them, but I think one that works really well without being melodrama-land is Drace's death scene in Final Fantasy XII. This one got me especially because it was so well directed in a way that really got to me. 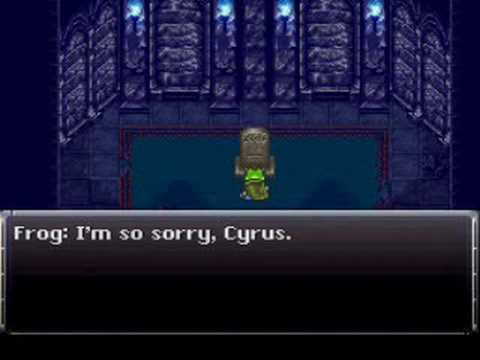 It was the first time where I saw something in a video-game directed in such a theatrical way and how it really played into the development and inner turmoil of Gabranth, as a man who cannot accept that his loyalty lies away from the Empire. 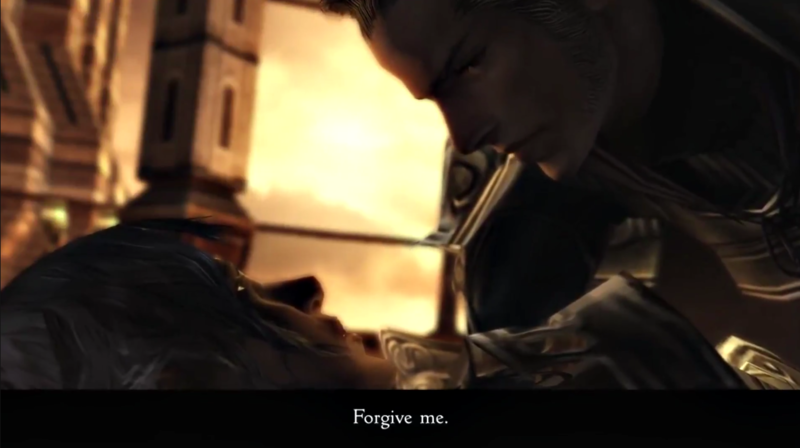 The look and feel of this scene, the lighting, the intimacy between these two characters in a way that looks closer to love than a summary execution, even down to the way Gabranth kills her. And we will never know if they loved each other, or just respected each other for what they stand for. But it was irrelevant, they both had a duty to fulfill to the Empire, but above all to themselves. I think it's a brilliant scene that made me choke up both by the gravity of this scene and by the great execution in terms of cutscene direction. Jun Akiyama and Yasumi Matsuno are gods. C'mon folks, if you played the game blind, this one hurts. At first I was like, what's with the blatant clipping on a CG scene?? fakes you out and the game shows his shadow putting his gun to his head and pulling the trigger after he sees his son turn into crystal. They definitely got me with that one. First time a game made me tear up was FF7. It was when we found out the truth about Seto and The Great Warrior theme came up, I was in tears the whole time. Ramza... What did you get? And the ending to Panzer Dragoon Saga. That first piano note as the materia/pearl falls from Aerith and hits the floor is so profound that I immediately teared up there and then. I think I was only nine years old at time, and it was the same year that my dear Nana passed away as well as the family of my good school friend who lived down the quiet street from me abruptly upped and left the UK to go and live in Chicago. To my dumbfoundment, this exact image is on the back of the game case! I didn’t think anything of it at the time though, especially as a nine year old. When you use the sensory stone that contains Deionarra's last moments. The pacifist ending in undertale as well. Zack's death scene from Crisis Core. The Bloody Baron story/ending (depending on choices) in Witcher 3. It makes you feel bad for a terrible person. +1 to Deionarra's sensory stone from Planescape: Torment. The start of Act 2 was feel-inducing. Yeah that scene was sad. Lovely game. The final moments of Mother 3, no doubt.